Comment: Delivery may take 14 - 28 days. Quality checked pre-owned articles. Article in excellent condition. Play Mini-Games In The Arcade. Erase Mistakes With The Second Chance Option. Nancy Drew enters a circle of fear and crime as she explores a seaside amusement park thats swirling with secrets. An antique carousel horse has been stolen and now, late at night, the merry-go-round begins operating on its own. Are the painted ponies searching for their missing lead horse or is there another explanation for these midnight rides? The answer is well hidden and finding it will take courage and skill. Nancy is invited to the Jersey shore to investigate a series of mishaps that have occurred at the Captains Cove Amusement Park. The missing lead horse was stolen from the carousel and now, the roller coaster has lost power resulting in a serious accident. Although the park is closed until the insurance company can investigate the accident, several workers still remain on site. Those workers include the parks bookkeeper, Joy Trent, who has a peculiar robot companion named Miles; the chief engineer, Ingrid Corey; Harlan Bishop, the security officer and Elliot Chen, the parks art director. Nancy starts investigating and learns about the reclusive genius, Rolfe Kessler, who carved the carousel in his long forgotten hidden workshop. She also discovers the sad history of the parks former owner, Daryl Trent, who created the robot, Miles, for his daughter Joy. He hid puzzles and riddles about the park to reunite his daughter with her past. 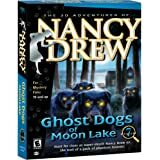 Nancy can only discover the truth behind the haunted carousel after solving a series of puzzles and avoiding several deadly traps. Great product, and works just fine :) Thanks so much! Love all the ND games. 5.0 out of 5 starsFun, cool, and better than the previous one! "The Haunted Carousel" is the eighth Nancy Drew PC game, and this one likely won't disappoint. Rich in detail, this game was obviously well-planned and well-made. The graphics are awesome, the storyline is believable, the characters are interesting and amusing, and the game is all-around great. In this game, you, as Nancy Drew, get full access to an amusement park where, recently, some very odd occurances have taken place. Search for clues, play games, solve puzzles and riddles, and -- in the end -- solve a mystery and outwit the villain. 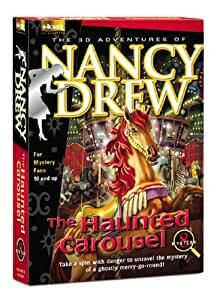 Like all the Nancy Drew games, "Haunted Carousel" brings gamers hours of entertainment and lots of fun. "Haunted Carousel" is, in my opinion, much better than its predecessor, "Ghost Dogs of Moon Lake," which I found to be rather disappointing due to the fact that the games and puzzles seemed dull, and didn't tie well into the game. In "Carousel," the presence of a carnival midway allows for the presence of games without the feeling that the games are weirdly out-of-place. Also, the educational elements of this game (which are present in all ND games) are incorporated nicely and subtly. All in all, a great game... appropriate for ages 10 and up... adults will like it, too! Perfect to play in groups or even alone... "The Haunted Carousel" earns 5 stars from me! 4.0 out of 5 stars"Haunted Carousel" an entertaning ride. In "The Haunted Carousel," teenage sleuth Nancy Drew is on her eighth case: investigating amusement park "hauntings" in Captains Cove, NJ. One of the park's famed carousel horses has been stolen, and the carousel has been mysteriously starting and stopping on its own. Also, the park's roller coaster stopped suddenly, causing a rider to injure his neck. With the park shut down, Nancy must interview the employees and explore the park to find clues. "Haunted Carousel" has some nice improvements over past games: the addition of the "to do" list, journal, and cell phone (no more endless running back and forth to Nancy's hotel to call). If Nancy gets stuck, she can call her friends Bess and George and the Hardy Boys. The game has two levels, Junior and Senior Detective, and there are plenty of built-in tips and hints, including a park operating manual with an overview of most puzzle components. "Haunted Carousel" seemed to be one of the easier ND games. "Haunted Carousel" really draws the player into the park's atmosphere, complete with hotel room service, arcade games, a ride on the carousel (and chance to grab the brass ring), and more. The storyline flowed smoothly, the puzzles were organic (programming an arcade game, switching roller coaster tracks, repairing the carousel's band organ, reading invisible ink), the voice work was above average and the characters had distinct personalities. Music was pronounced, including carnival music for the carousel and ominous creepy tunes for the haunted house. Nancy must watch her step as always, since someone wants to stop her from finding out the truth behind the hauntings. Along the way she helps someone come to terms with the past, sniffs out an insurance fraud, and digs up long-lost truths and secrets about the park and its employees. This is a lovely adventure with a unique atmosphere that will delight young sleuths. 4.0 out of 5 starsNancy Does It Again! Once again, this is another one of the better Nancy Drew games. This one might be a little bit too easy or maybe just to some of us. It was really hard to guess who the culprit was this time. I didn't hate ANYONE because they were all pretty cool. The new added feature this time is a cell phone! Nancy receives calls while she's out and about and she can make phone calls anywhere she wants! It's not extremely spooky so you don't have to get too scared about it. It's not really scary at all. Just a little. This one was one of my 2 favorite Nancy Drew games! I definitely think you should buy this one. Oh and I saw a review that was labeled "Too Fast". I didn't read the review but I think that this game did go a little too fast. I mean not too fast for you to follow but you finish it too fast. I finished it in 2 days! The first Nancy Drew game I finished took me 7 days! Big difference. Nevertheless, this one was FUN! About it being very short... in other ND games, you had 4 or 5 masive rooms to explore... and when you got stuck, you had to comb threw every room a couple of times to see if you missed something... In HC there were 9 differant locations, over 12 differant rooms. Each was very small... So you didn't always have to wonder if you missed something, and explore a huge room... Just a couple of small ones. This break down was extremely helpful. The graphics were amazing, only, like Ghost Dogs of Moon Lake, the closed captioning would come on occasionaly when you didn't want it to. The music was great also, very amusment parkish... LOL. This game had a very good plot, and a lot of comic relief, not to much, but enough to make this game fun. I do have to say, the ending where you battle the criminal wasn't very long, so I was a little bit dissapointed, but It was still a great game. :~) I give it five stars.